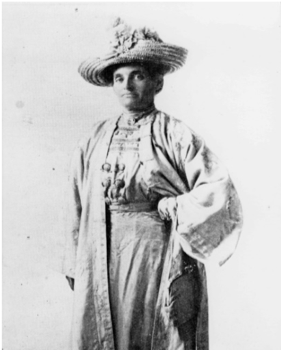 Selina Solomons devoted her life to women’s suffrage and was a key player with California passing its eighth amendment that granted women the right to vote in 1911. She was a Sephardic Jew, who traced her ancestry to Spain and England, and was from a middle-class family. Solomons’ father, Gershom Mendes Seixas Solomons, was one of the founders of Temple Emanu-El in San Francisco. In 1896, California failed to pass the right to vote. Solomons believed that part of the reason the amendment failed to pass was due to the number of elite suffragists that were not connecting with middle and lower-class voters. For example, the Century Club was the first all-women’s club in California, but was for elite women. Solomons founded the Votes for Women Club in 1910 in downtown San Francisco aimed at working class women (e.g. shop girls, clerks). At this club, meals were served and the women were educated on the suffrage movement. The club hosted lectures and forums advocating the right to vote and the reading room housed literature on the suffrage movement. The women at the club joined Solomons in canvassing amongst the working-class population. In 1911, California passed the amendment to grant women the right to vote by a 2% margin. California was the sixth state in the United States to grant the vote to women. In 1912, Solomons published How We Won the Vote in California: a true story of the campaign of 1911, which outlined the successful process that was undertaken to gain the right to vote in California from the lobbying to the fundraising efforts.